This bright and spacious, comfortable home offers sweeping ocean views from nearly every window. Two master bedrooms at opposite ends of the house makes it ideal for two couples - with or without children. Set on a beautiful, forested 5 acre lot near one of Maine's most popular state parks, and near historic Wolfe's Neck Farm. Bring (or rent) kayaks and launch from your own private dock. Watch bald eagles, osprey and heron soar overhead, and enjoy spectacular sunrises, sunsets, and fall foliage. Ample decks, covered and open, gas-fired barbecue grill.Well-maintained, modernized and fully furnished: kitchen with new appliances; gorgeous views from large dining area; sitting room with TV and stereo; reading room, mud room, washer/dryer, spacious bedrooms. Just 10 minutes to highway or excellent shopping in Freeport village with LL Bean and 100 outlet stores. Fine dining and casual restaurants, fresh lobsters, festivals, golf, art galleries, museums, theater, beaches, fishing, boating, and sailing opportunities. Visit Portland's historic Old Port with ferries to islands, fresh seafood, and unique shops. Enjoy Maine its best. New master bath and full bath on second floor. Shower bath on first floor. Gas fireplace in dining room. We were here over Christmas and had a wonderful stay! There was plenty of room for 6 adults. They had everything we needed to cook with in kitchen, games, air mattresses, walking trails and shopping nearby. The large dining table was a wonderful gathering place for us plus extended family who visited for Christmas. The views and sunrises were absolutely spectacular! Excellent location and manager, Jackie, was prompt in answering any questions we had. With the beautiful views and proximity to hiking trails it was a pleasure to stay there. We had a few bumps in the road but the property manager was wonderful and managed to fix things quickly. What we loved about staying here: the view of the shoreline. Our 4 granddaughters loved exploring the rocks looking for shells and taking long walks through the countryside. The kitchen had everything you could want (except a can opener that worked). We went apple picking outside of Brunswick and came home and made an apple pie. It was very peaceful and so relaxing for the 4 adults. Day trips to Bath, Kennebunkport, Camden and of course Freeport LLBean! The house had enough water, towels, pillows and the makings of a fire for smoores. It was awesome! The only one small suggestion I have is to pull everything out of the kitchen and clean the cabinets and anything in it. I had to wash anything we used because they were either sticky or dirty. I washed all of the silverware and the container because it was dirty. We loved it and ALL of us would love to come again in a couple of years. Thank you for allowing us to make memories at your house. When you get to be grandparents it is the memories of spending time that will be remembered; not just buying "stuff". We had a super time in a lovely house in a great location. Thank you! Great family retreat. The owner's hospitality was marvelous. 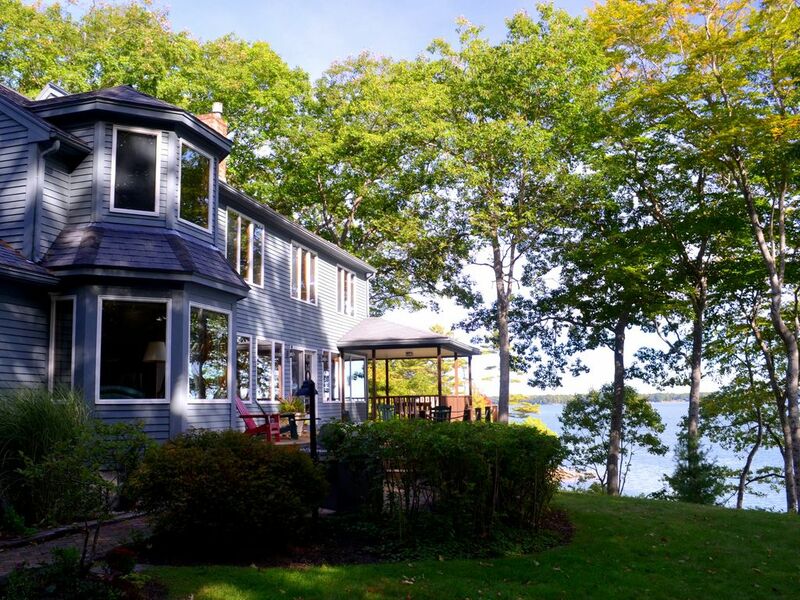 The home offers a perfect balance between a beautifully remote retreat and Freeport enjoyment. Everything was perfect: house, scenery, houspitality,, everything! Thanks so much, Beverly! It was a pleasure hosting you, and we're so glad you enjoyed your stay. Hope to see you again soon! Several parks and nature reserve nearby. Wolfe Neck Woods State Park within walking distance. LL Bean Kayak school adjacent. Location is 2.5 hrs from Boston, 30 minutes to Portland, 1 hr to Boothbay Harbor, 2 hrs to Camden. Charter sail and fishing boats in South Freeport (7 miles), also boat trips to see seals and Eagle Island, summer home of Admiral Peary, now a state Park. Boat launch at nearby Porter's Landing or Winslow Park.